It constantly surprises me how new food concepts keep popping up - the result of someone's brilliant idea or new technology that opens the door to different cooking methods. 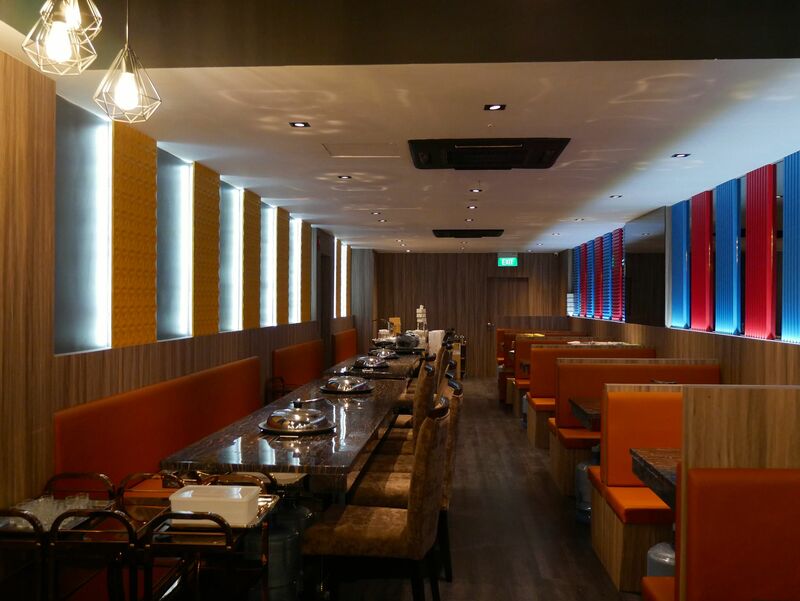 Steam Box, a new restaurant that opened in Serangoon Garden about two weeks ago, is the result of both. It uses an innovative steamer that cooks food at the table at high temperatures. The flash cooking allows food to keep its flavour better and because most of it is not marinated or just lightly seasoned, diners get to enjoy its natural taste. Steam Box is not the first in Singapore to introduce this concept, which is like a stockless hotpot. There are other places such as Rong Fu Ji Seafood Steam Pot in The Grandstand, which opened in December last year, but these have been pretty low-profile. I had not heard about them until I researched this cooking method after trying Steam Box. I heard about steam-pot cooking early last year, when a reader in Hong Kong e-mailed me about a place there which offered it. However, the eatery's location was unfamiliar to me and, when I visited Hong Kong last October, I did not have time to hunt it down. Still, the idea fascinated me. Food is placed on a steamer tray with a pot underneath and cooked by steam generated from a water container under the table. Under the tray is a claypot with raw rice grains, stock and various ingredients. As the food is steamed, the juices drip through the tray into the pot, where the rice slowly turns into congee. It sounds wonderful, being able to taste the natural taste of ingredients. For this concept to work, freshness and quality ingredients are paramount. These conditions are generally met at Steam Box, limited by what the markets here have to offer. Seafood is a safe bet. Steam Box has introduced two new items since opening - Crayfish ($25) and Barramundi ($18) - and both pass the freshness test. Items such as Fresh Flower Crab ($15) and Fresh Clam ($13) are hard to mess up as long as they are not overcooked. The steam-pot concept is devised to ensure that the food is not overcooked. Food is served on coloured plates, with each colour indicating how long the food should be steamed. The pot has a built-in timer with a buzzer to alert you when the food is ready. Operating this can be a bit stressful at the start, as you figure how the pot works and everyone scrambles to remove the cooked food before you can place more raw food into the steamer. But you get the hang of it and will figure out that you should start with items that cook faster - so you do not have to wait too long to begin your meal. Or how some things can be placed together on the tray even if they have different cooking times. You just have to remember when to take what out. For the meats, my favourites are the only two marinated meat dishes on the menu: the Chef's Marinated Minced Pork With Premium Salted Fish (from $4.50) and Chef's Marinated Chicken Thigh With Wolfberry (from $4.50). Both are classic Cantonese dishes that are cooked perfectly in the pot, with the meat smooth and juicy in both cases. Unmarinated meats such as Premium Iberico Black Pork (from $9), Pork Collar Slice (from $5) and Premium Prime Short Rib (from $11.50) taste good, but lack that smooth texture. Although I am initially reluctant to pay for plain steamed vegetables, I am persuaded by a colleague who had also tried Steam Box, to give it a try on my second visit. Her point is that they help to give your palate a break from the meat and seafood. I enjoy the Dou Miao ($5), which although rather overpriced, turns out sweet. But for sweetness, nothing can beat the Chunky Premium Pumpkin ($5). There is dim sum too, with items such as Siew Mai ($4.50), Prawn Dumpling ($0.80) and Prawn Rice Roll ($5.20) freshly made in the kitchen. I also enjoy having Beancurd Skin Roll ($5.80) steamed instead of deep-fried for a change. It is healthier too. Steam Box provides a selection of sauces and condiments that you can mix yourself, like what you do at hotpot restaurants. But since the idea is to taste the natural flavours of the food, it does not make sense to cover them with a spicy sambal or a sweet chilli sauce. The best condiment is a blend of light soya sauce, minced garlic, sesame oil and sliced chilli padi. The chilli adds spice, but does not mask the food flavours. At the end of the meal, the steamer tray is removed to reveal the congee underneath. Steam Box offers two options: Pork Rib, Century Egg And Parsley ($15) and Clam, Dried Scallop And Ginger Slice ($18). I prefer the pork rib version, which is a more traditional Cantonese congee flavour. I like that the meaty rib is tender, but not soft enough to fall off the bone. The clam congee is, disappointingly, not as sweet as I expect, despite the shellfish juices and the stock used to cook the congee. What is nice, though, is that the clams do not taste rubbery despite the long cooking. But the rice can do with a longer cooking time. Both times, I find the grains soft, but not broken into a smooth gruel. So, you get sort of a cross between Teochew porridge and Cantonese congee. Still, it provides a comforting finale to a healthy meal. •Follow Wong Ah Yoke on Twitter @STahyoke •The Sunday Times paid for its meals at the eateries reviewed here.